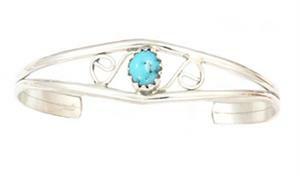 Navajo made sterling silver baby bracelet with one free form turquoise stone. Measures about 3/8" wide at the top and tapers down. Wrist size measures approximately 3 1/4'' with an opening of 1''. Stone type and shape will vary as well as color shade. Made by Judy Lincoln.